At first I was thinking that I'd write up individual posts discussing what I thought about books 5, 6, and 7. In the end, I decided I just couldn't do it. Part of the reason for that is that when you are reading through a series it starts to become difficult to pick up and leave off at the correct place for each book. The other reason is that I know that others out there haven't read this series yet and I don't want to spoil the greatness of it for them. Yes, I said "the greatness." Those words actually came out of my mouth. Basically my August was consumed with Harry Potter. After reading book 4 I couldn't rest until I had completed the series. That is the point in the series where things picked up for me and I became irrevocably intrigued. Jonathan gave up on me there for awhile. 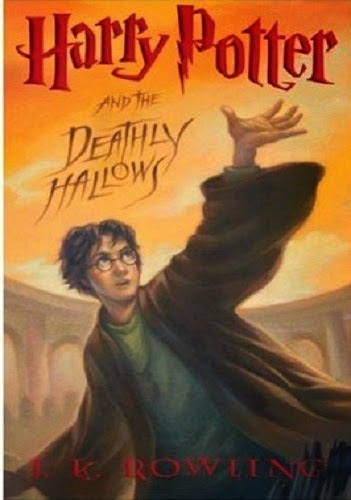 He told me that I really needed to go to bed at a decent hour when I was halfway through The Deathly Hallows (Book 7). (I love him, but some things you just cannot do.) I did make myself go to bed at midnight that night, but then I woke up at 6:30 and DEVOURED the ending before he had to leave for work. And then I was depressed for the whole of that day and the several which followed. I still haven't gotten my reading mojo back. I'm still recovering from Harry. Now, those of you who know me and have tracked with me for awhile know that I didn't enter into this series with fond thoughts and hopeful expectations. The truth is, I rather expected to hate it. By the end of it, I didn't hate it, but I do retain some concerns. I think the concerns absolutely should not be ignored and should absolutely be considered if a person is thinking of reading these books for themselves. I would indeed offer a word of caution relating to the form of magic that is used but I also wouldn't suggest to anyone that it would be a sin issue to have read them. I would most definitely apply the concept of Christian Liberty to these reads and allow Christians to decide for themselves, as individuals, whether or not they should read them. Some will choose not to and I think that is a good choice. Others will choose to read them and I think that's also a good choice. You know yourself. Keep your conscious clean before the Lord. Understand what you are getting into and enjoy them if you are able. I discovered myself able and I in no way feel guilty. Post-reading of the books I spent a day reading articles and interviews online with the author, actors and actresses who brought the Harry Potter characters to life on screen. I watched the behind-the-scenes for the last movie and bawled my eyes out as the actors said their good-byes. (They were cathartic tears.) I even watched Oprah's interview with Rowling. (This is a marvel, considering my general distrust of Oprah's growing empire.) The interview is 45 minutes long but if you have the time, I rather recommend it. I found it both intriguing and insightful. Harry Potter was a reading journey that had some unexpected twists and turns for me but ultimately I'm quite glad to have gone on it. I found it entertaining, enthralling and very thought provoking (even if I'm not hashing out a lot of thoughts on the last few books). Are the Harry Potter books like Narnia? No. Definitely not. Should/Can Christians read Harry Potter? Yes. In answering these questions, I found myself delighted along the way. Win, win! I finished these up at the beginning of this year. I agree with your reviews and cautions. Thank you for sharing. My favorite book was the last, btw? Do you have a favorite in the series??? I agree with your answers to the most popular questions. I think it's funny how people get wrapped up in comparing Potter and Narnia, as if you can compare two different worlds, let alone writers. I am both bolstered and convicted when I read Narnia, because Cs Lewis walked so closely with The Lord you can plainly see the parallels between Narnia and Christianity. I wept my way through our last Narnia challenge. I keep meaning to do a write up. The world of Potter is different, I love it, I enjoy how far ahead she thought when writing the separate books. I enjoy the colorful characters and the life lessons to be learned in those pages. It gets to me as any good books do. I tell people; Start with Narnia! move on to Tolkien, then read Potter. I'm so glad you've read them! I had way too much fun watching you enjoy the Potter journey. I should probably reread them now. I had much the same experience last winter. I was living in England at the time and my British friends were horrified that I had never read them, and insisted on loaning me the first book. The first three I read with only mild interest, the final four I devoured (and we watched the films together as I finished each book). I had never been interested in reading them, I did not expect to particularly enjoy them, but OH!! am I glad I did! Oh, Sky. (Sigh.) You summarized in one simple paragraph. Go you. @They all me mommy - I think the 4th is my favorite. But I dunno. I liked aspects of #5. And I really liked six. But let's go with 4. You are 100% correct in your conclusions, and it makes me smile that you reached them. Yes, book 4 is the tipping point. I think I've said my piece in the past. Glad you enjoyed the ride and thanks for reminding me how they should be approached. I thought that I wouldn't be a Harry Potter fan until I read them. I understand your concerns, and do not fully disagree. For me, Harry Potter is excellent modern day literature. There is so much to learn, question and discuss beyond simply having a blast on the reading journey. Too bad that many books written these days geared towards middle school through high school ages are not worth reading. I do appreciate your insights on the books you read. @sky --- I love what you tell people. Except, I'm one of those who cannot enjoyable and without some sort of force get through Tolkien's books except for the Hobbit and a good amount of Return of the King.